I am a big believer in pursuing your passions and creating what you love, so last year I decided to follow my passion and design an eco-friendly, organic silk bridal collection. I am so happy to be able to share with you the designs which I have put my heart and soul into. 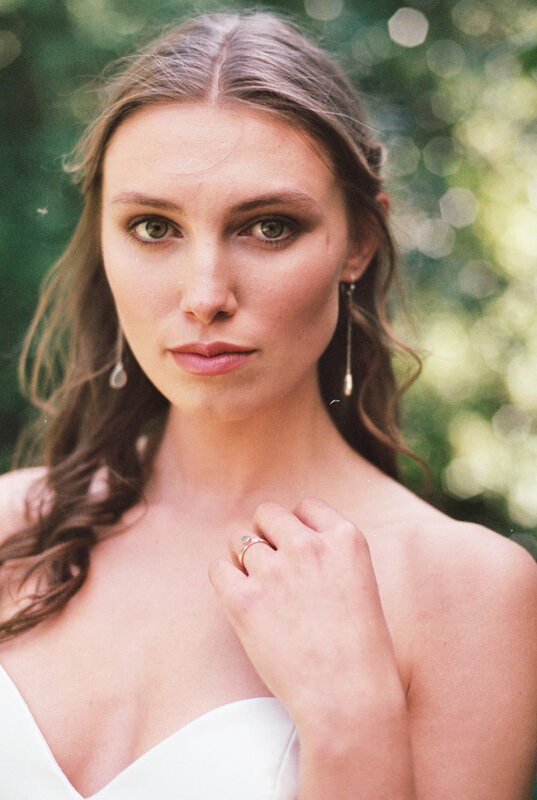 Every aspect of the Organic Bridal Collection has been meticulously thought through. Designed to be a smaller collection which can be really easily interchanged with other garments to create completely different looks, taking the focus away from 'fast fashion' and making the garments much more versatile. I love the idea of building upon your dream dress with your own personal touches. 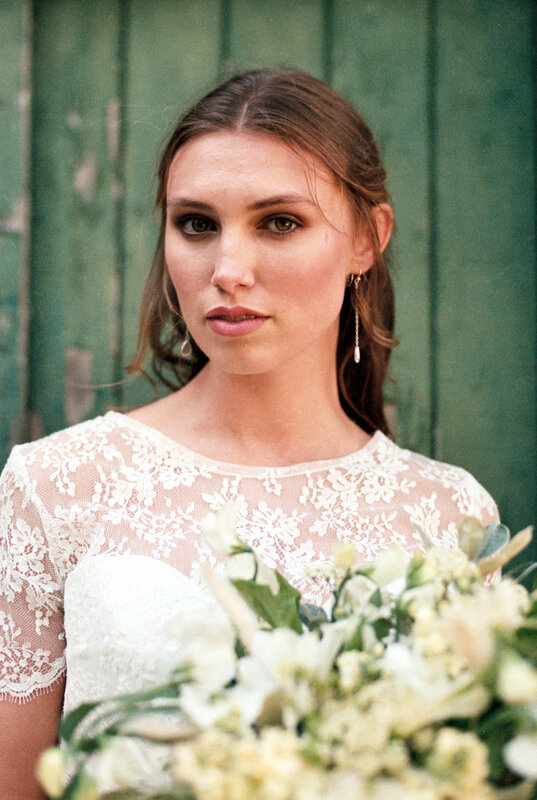 As a dressmaker it is incredible exciting to see a bride put her own mark on her wedding gown, adding a different neckline, using a different lace trim or adding layers to a beautiful skirt. I like to encourage brides into making their dress exactly as they had imagined, and even better to do that whilst thinking about the impact on the environment. I believe it is fundamental that we raise awareness for a healthier textile industry and promote more eco-friendly products and processes. Choosing to buy into quality, and to invest in the passion and the skill of who has made the clothing. Each dressmaker/designer has a different voice and therefore each garment they produce has part of their passion within it's seams , which is why I think it is so important to know the dresses story from not just the final product, but right from the intial design. It's so exciting to be using these organic fabrics and to create a range of amazing organic wedding dresses! See the collections here! Supplier list in previous blog post! Photography by Olivia Bossert. The thing I love most about creating wedding dresses is the way they can make someone feel, a flowing silk skirt or the feeling of lace against the skin can add so much to the emotions that a bride feels. Real dressmaking isn't just about the intricacies of the craft, it's also about the person behind the clothing, who they are as an individual and combining the two to create something magical. This is what I also love about styled shoots, the way they can evoke emotion, the slight movement of a hand against delicate fabric or the subtle look in someone's eyes. There is so much work and talent that goes into creating a styled shoot, and they're often big collaborations from different suppliers. It's not often either that you get the chance to see a snippet into the work behind the photographs, so what better way than to watch a behind the scenes video. This video was created by The Wedding Edit and is a beautiful view into the Organic Bridal Collection photoshoot. Take a look and see the shoot come to life! The day is finally here! I get to show you an incredible story and a rare behind the scenes look at an Artisan collaboration with some amazingly talented, local suppliers here in Cornwall. 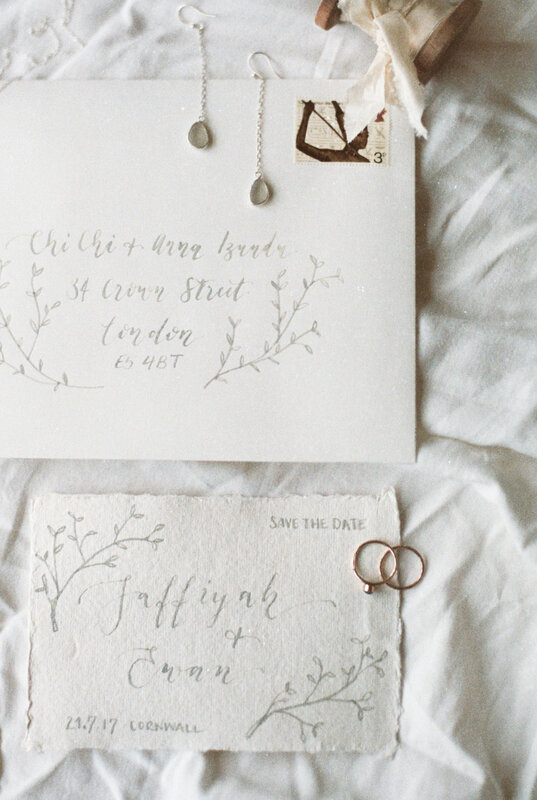 There is often so much more to creating a bespoke bridal look than you might think. The beauty in the creative process is one to be treasured and appreciated, as well as admiring the stunning finished product. There is so much planning, thought and craft that goes into each aspect, it's a pleasure to show you more to the story. Each one of our buisnesses has a deep respect for our natural and organic environment and in this instance, we focused our inspiration around our beautiful home by the sea in Cornwall. Taking you from the very beginning, we show you the wonderful possibilities of organic product, materials and processes in creating a bridal look, starting with the organic/eco friendly silk fabrics, using local Camellia flowers for natural dyeing, through to creating a bespoke wedding gown, organic flowers for the bouquet, beautiful stationary, locally crafted jewellery and stunning film photography. This is something I can truly say I am deeply passionate about, it is an incredibly exciting thing to create such beauty whilst doing what we can for our enivornment and it shows how easily accessible it can be. I plan to write a future blog post going into more detail about the amazing organic/eco friendly fabrics that I used to create the bepoke wedding gown. See Cottage Hill Magazine to read the full story! Earlier this year I had the chance to work with a brilliant team of suppliers at a really wonderful location and wedding venue, Enys House in Cornwall. The building, once part of a grand estate has 800 years of history and is truly enchanting, the perfect setting for a vintage styled photoshoot. The 1930s had the most beautiful aesthetic, the height of decadent luxury and romance. The model wears a full length silk chiffon and crepe skirt, with an intricately beaded tulle cover up all finished with couture techniques. 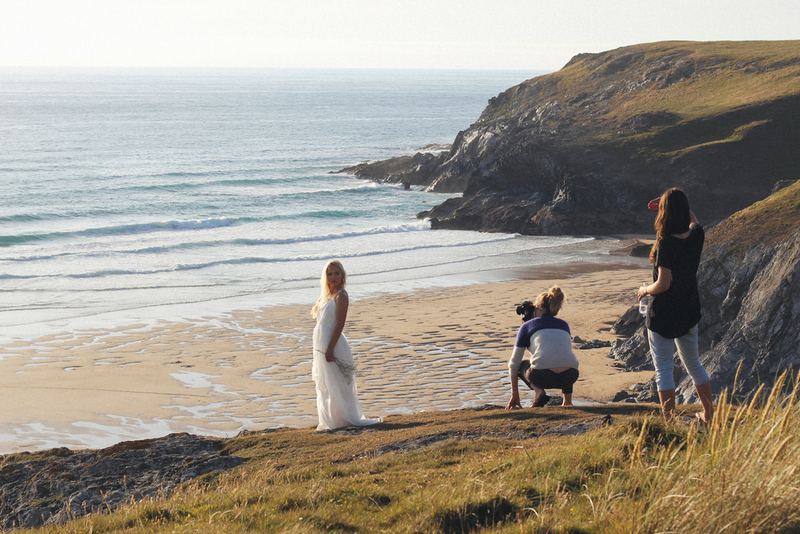 This wonderful photoshoot can currently be seen in the latest Cornwall edition of Wed Magazine. Last weekend I worked with an amazing team of suppliers here in Falmouth. Despite the stormy September weather outside beating on the windows, we were indoors in the studio keeping warm and creating this wonderful photoshoot, which I couldn't wait to share. Take a look! If you are interested in any of the gowns in the sample sale, enquire now for a consultation. I am also incredibly thrilled to soon share with you some exciting news! I really adore collaborative shoots and this month I had the chance to be involved with a fantastic team of suppliers on a styled shoot for Cornwall Today Magazine. 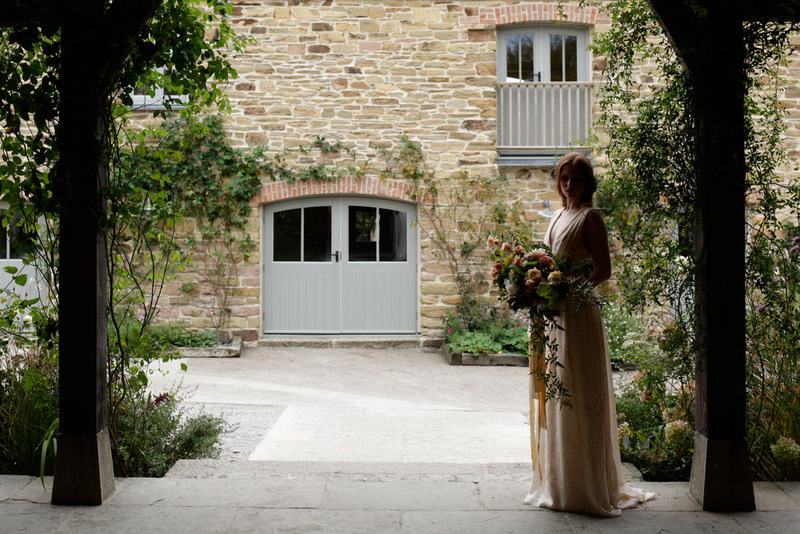 A recommendation of favourite Cornish wedding suppliers by Jenny Wren Weddings and Events, the shoot was at the beautiful Pengenna Manor, an 800 year old private family home and wedding venue. The cold January weather made the warming fire inside even more inviting. The table was dressed with a grey/yellow colour theme, with illustrated name cards created by Pip Designs and finished with a centre piece of colourful flowers by Wedding Flowers in Cornwall. There was the finest attention to detail even down to hand painted biscuits by Emily Hankins and grey wooden chairs by Star Gazey Hire, creating a wonderful combination of modern country chic and historic family home. Despite the freezing weather, braving the elements was definitely worth it, showcasing the romance of a winter wedding in Cornwall and perfect to keep in mind if you're planning a winter wedding. Yesterday I had the pleasure of showing my 'Perl Collection' of wedding dresses at the wonderful Trereife House, a beautiful manor house and wedding venue nestled at the very southern end of Cornwall. They opened their doors to couples to take an exclusive look around the house and enchanting estate, and gave them the chance to meet a selection of brilliant handpicked suppliers from ornate cake designs, to wedding day food inspiration. A warming open fire and a beautiful live piano performance really set a romantic winter wedding scene throughout the house. Upstairs I showcased my collection in a beautiful room along with Jenny Wren Weddings and Events and had an amazing time talking to couples about plans for their big day. Thank you so much to the Le Grice family for a wonderful day. I am so excited to show you this wonderful shoot taken at Nancarrow Farm this week. The team were amazing and it was such a beautiful autumnal day, capturing the new Perl Collection. The new Perl Collection is now available! All designed and handmade here in the gorgeous county of Cornwall and inspired by the incredibly beautiful 20s and 30s. I am so excited to share with you that 'The Perl Collection' will be available in October. It is currently all hands on deck hand finishing all the pieces from design to creation, using only 100% silk and fabrics made in Italy and France. There are four options to choose from. The first two looks 'Tegan and Gwynn' are separates which you can interchange, giving you the freedom to create the exact look you want and are created using a stunning, 20s esque, intricately beaded tulle, a gorgeous flowing georgette and an amazingly soft double crepe to feel incredible against the skin. The third look 'Isel' uses a French Chantilly Lace within the bodice and as part of the incredibly soft, delicate looking skirt which is pannelled to create volume and flow. The fourth look 'Lowena' is something I'm incredibly excited about. The fabric is a beautiful soft pink, floral print georgette, made in Italy by a company which holds a royal warrant from the Queen. Five metres make up the volume of the skirt to give you the full impact of the stunning print. Something a little different from the norm of bridal! 'The Perl Collection' uses words from the Cornish language to name each look, reflecting my love for my home county and the amazing design we inspire. The names 'Tegan, Gwynn, Isel and Lowena' mean pretty, fair, soft and joy. A few weeks ago I had the pleasure of attending the wedding of Billy and Annie, in the gorgeous setting of St Just in Roseland. Annie wore a bespoke gown and veil made with a stunning lace, a sand washed crepe and an embellished trim to finish off the neckline and back detail, all handmade in my studio. We wanted a vintage feel, whilst remaining soft and delicate, layering the skirt with a delicate georgette under the lace. What an amazing day it was and Annie looked stunning! Our first shoot was taken in a stunning location on the coast in Cornwall, surrounded by long, flowing grasses and brilliant sunshine (what luck!). We had so much fun and the whole team were brilliant. 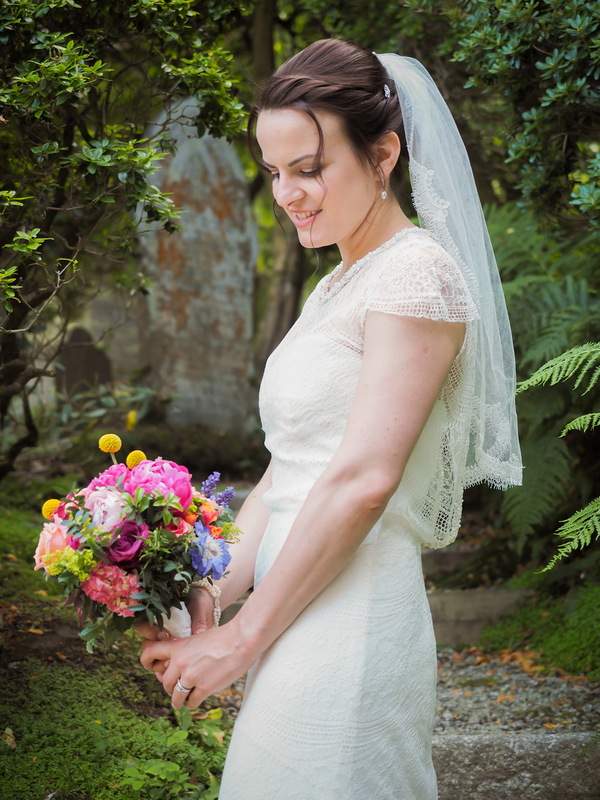 We wanted it to look very natural and soft with styling, showcasing the delicate dress and emphasising natural beauty. Here are a few shots from behind the scenes!